Ages 6 through 17. 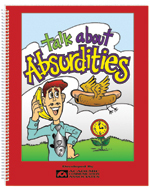 Challenge students with language and learning disabilities to use precise vocabulary as they describe absurdities in pictures, sentences, and short stories. Absurdities in Sentences. Each worksheet in this section includes nine absurd sentences. The student's task is to identify the absurdity in each sentence. Absurdities in Short Stories. The stories in this section include sentences that do not make sense. Students are asked to describe what does not make sense. Picture Story Fun. The stories in this section include humorous pictures. The student's task is to describe what does not make sense in the story and to describe the absurdities in the picture.